It’s Friday again and that means another weekend…. 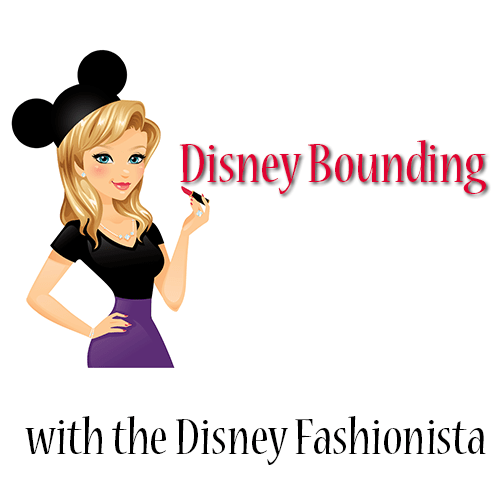 and it’s time for a new character in our Disney Bounding series. This week we are going to stick with the villains, as it so close to Halloween, and we are going to discuss the fabulous Queen of Hearts. This villain gets overlooked many times as she is not necessarily the most popular. She is, however, one of the most fabulously dressed! Her full skirt, long cloak with high collar and her confident attitude with which she carries it all. 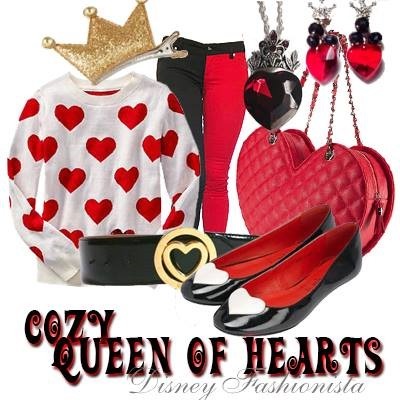 Let’s take a look at two different ways to pull off Disney Bounding with the Queen of Hearts! 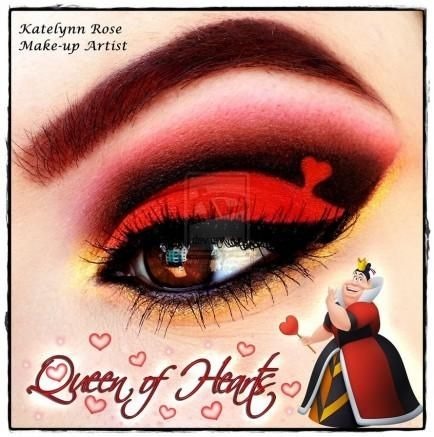 The Queen of Hearts is primarily represented by 3 colors: Red, black and gold. In the above look, we designed an outfit for the cozy fashionista. Perhaps this is a look you would wear before going out and dressing in the second look or maybe it’s just the style you most adore. Whatever the case may be, this outfit is comfortable, relaxed and yet just enough to go out and look chique. This look includes comfy black and red stretch pants, a white sweater with red hearts and a wide black patent belt with a gold heart-shaped buckle. These are the three colors we identified as the Queen of Heart’s primary colors. A fabulous gold crown clip (and it’s sparkly) just like the gold crown the Queen wears, black patent shoes that compliment the belt and a heart-shaped red leather purse almost complete this look. To round out the finishing touches we have our fashionista wearing fabulous heart-shaped earrings in a brilliant red and a deeper red heart-shaped necklace. These fabulous pieces were handcrafted by Beautiful Baubles and I could not be more in love with the jewelry I’ve discovered there! I have spoken with the creator of Beautiful Baubles and she has generously agreed to offer a 5% off discount to those who wish to purchase these, or any other, pieces she has in her store. If you are interested, please feel free to visit the Beautiful Baubles Etsy store and enter discount code DisFashion5. 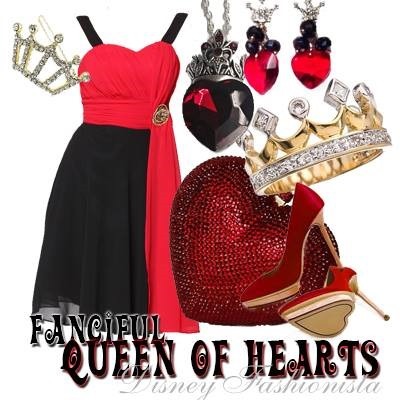 Our fanciful Queen of Hearts look is for the fashionista who is going out on the town. Whether she is going to dinner, a party or the club, she is ready to rock her Queen of Hearts side. This fabulous flowy black and red dress with the subtle heart-shaped bust line paired with the red and gold heels (check out the heart shapes on the soles) are the perfect start to this outfit. It then, of course, needs it’s accents. We are not afraid to mix metals when it comes to accessories and you shouldn’t be either. We have started with a silver crown barrette, gold crown ring, the aforementioned necklace and earrings from Beautiful Baubles and a fabulous red jeweled, heart-shaped clutch. I know I would love to rock this look! Last, but certainly not least, we need to talk about makeup. The above look is another creation from the fabulous Katelynn Rose! I mentioned last week that these eye looks are bold and may be too much for some of you but, as far as I’m concerned, that’s part of the fun of it. I have been a MAC girl since I was a late teenager (we had it in Canada first!) and, as many of you are aware, MAC does not shy away from color. The above look is something I would like to try as an artist and makeup lover. The heart stencil adds an extra degree of difficulty to this look but, if you wanted to try it and were fearful of the heart, this look would be just as fabulous without the heart and just using the red, black and gold colors. Here’s how to make this look a reality. 2. Use the gel liner to create the cut crease and draw the little heart. Use make-up remover on a little brush to clean up any mistakes and make the heart shape perfect. 3. Apply the red eyeshadow all over the lid and into the heart shape. That’s another week here at Disney Bounding with the Disney Fashionista. What do you think? Would you wear either of these looks? I’d love to know! Let me know what you think in the comment section below!